Copper Diem's Amy has the Monday wish list going. At first I thought there wasn't really anything that I was wishing for or wanting. HA! Fat chance of that happening. 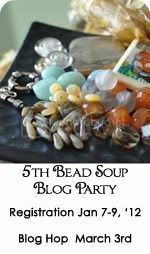 I was reading about this: Interweave's Bead Fest. In Philadelphia this month and in Texas in October. Fun. Instructive. Educational. Gorgeous beads. Yes, I would wish for that. For sure! Or this one: Weekend with the Wire Masters in California in November. (I'll actually be in Southern California when this is happening but will be busy w/ family and not working the wire). Besides, I'm not wire master or anything close but I would love to learn more about it. And as long as I'm dreaming, it's not too soon to start wishing for this one, too: June 1 thru 10, 2012! Awesome. I'd also love to go to Tucson and just see what it's like. It sounds like sensory overload but I think it would be great to see -- even if just once. Nice dreams ... but I don't see any of them happening this year. So those are my wishes for this week. I'll try to contain myself now but reading about all these great opportunities for learning new stuff has me jazzed again! My biggest wish is health for my dear friend Teena who has just been diagnosed with cancer. We've been friends for nearly half a century (yeah, we're old!). She just retired in June and is ready for some fun, not this crap. Your prayers, good thoughts, positive vibes, healing light and energy will all be welcome for her. Thank you. Teena is in my thoughts and prayers sweet Sally. Keep dreaming, you just never know when or HOW things will fall into place...got my fingers crossed that better days are ahead for YOU! Thinking of your friend Teena, Sally. How did I miss this post?? I'm wishing for all those things too, and wish we could do the beady ones together! I'm still toying with the idea of going to Beads East, I would have to go myself, which I don't mind, but with almost 3 hours of driving I'm nervous my legs might start acting up. I can't decide!!!! Blessings to you and Teena! Oh I love the colorful bracelet - beautiful!